Mortgage Broker Calgary. Mortgage solutions. The process of buying a home, specially your first home, can be frustrating and overbearing. Click here to get info on how we can best help you. When it comes to mortgages, most people are used to dealing with banks so their first instinct is to approach the bank they have an account with and ask them for a mortgage. While this definitely an option, it might not be the best option in your case. Dealing with a mortgage broker to sort out what your best options are clears some of the confusion and stress surrounding this process. Learning about mortgages and selecting the right one for your situation becomes easier and less overwhelming. There are literally hundreds of mortgage products available, and making the right decision will save you thousands of dollars and take years off your mortgage. By reviewing your unique circumstances, you will receive unbiased guidance to help you with your final decision. The main objective is to provide value and make sure that you, the consumer, get the ultimate mortgage that works best for you. Dave Alberda, is a mortgage specialist who has long standing relationships with many banks and financial institutions and he is able to provide you with a variety of options and best rates. Watch this short video to better understand how to choose a mortgage broker, what things to consider when you are looking to get a mortgage loan. has no money for down payment. 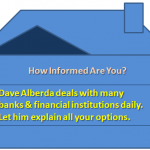 Dave Alberda has helped many clients with their mortgages in a variety of situations. As an experienced and well connected mortgage broker, he will work on your behalf to find a way when others cannot. He has knowledge and experience in dealing with bad credit mortgage needs or no down payment or low down payment mortgage options. In the Calgary area, there are many different types of mortgages from conventional fixed rate, variable rate, home equity lines of credit, high ratio (low down payment), commercial, and construction mortgages. Even if you have issues with your credit history, we can find the Ultimate mortgage for you! Your interests will be served well if you choose us as your Calgary mortgage broker! Contact us Today via telephone or online form and find out what your best options are!